Hong Kong is a great place to land if you’re looking to try some authentic Cantonese cuisine. Are you looking to add a new stamp to your passport? Go traveling all over Asia this summer. Whether you have some local relatives or if you’re just overcome with wanderlust (and hunger!) Hong Kong is a great place to land if you’re looking to try some authentic Cantonese cuisine. Here in the United States, you might have tried Peking duck before. That roasted duck has crispy skin, juicy meat, and is often accompanied by little pancakes and plum sauce. 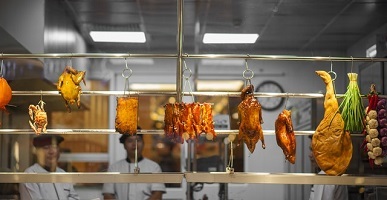 Take it to the next level when you get to Hong Kong and try this other icon of Chinese cuisine: roasted goose. You’ll find that the goose is cooked in a similar style to the duck, only the sauce will contain scallions, soy sauce, honey, and garlic instead of only plums. Going to dim sum every weekend has paid off, because you’ve sampled, or have at least watched, as someone samples the sticky rice. They’re quite similar to dumplings, except they’re served in a lotus leaf instead. The rice inside is packed with savory add-ons such as chicken, egg, sausage, or shrimp, all of it awash in a delectable sauce. Leave some room for dessert! You might be too full to even think about eating anything else, but you can’t pass up the egg custard tarts. Since dim sum is a specialty of Cantonese cuisine, you’ve probably already tried some the last time you went to brunch with your family. But when you’re in Hong Kong, look in every bakery you find for these sweet and flaky treats – you won’t be disappointed! For an extra burst of flavor, cool off with some iced chrysanthemum tea before your next stop. This entry was posted on Friday, July 13th, 2018 at 8:51 am . You can follow any responses to this entry through the RSS 2.0 feed. Both comments and pings are currently closed.